In most scenarios, connecting your Method account to a QuickBooks file on your desktop is an easy process that takes 15-30 mins. Follow the detailed steps in this article or watch the installation video to learn how. Your QuickBooks Desktop file open within QuickBooks Desktop (on Windows). Supported Windows Version. You can install the Method Sync Engine on Windows 7 and higher. For those on Windows Server, please see our separate set of installation instructions (Windows XP and older are not supported). QuickBooks Admin permissions (for initial sync only). At this point, you should be signed up and waiting for the sync. If you do not have an account, please sign up for a trial. 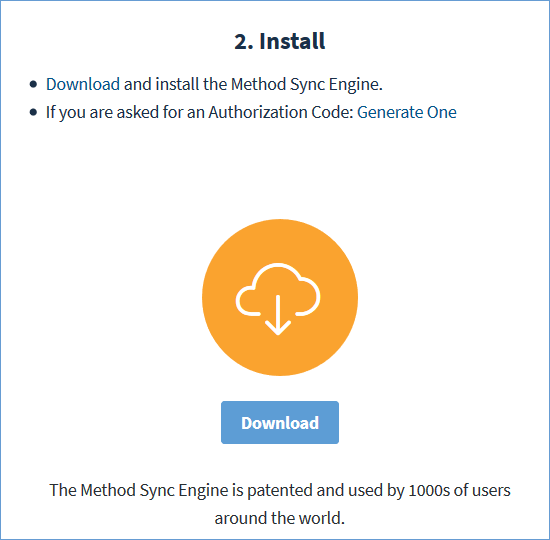 When you sign up with Method, you will be given a step by step guide to start the sync, however, if you skip that guide, we will outline the steps here. Open your QuickBooks file to the company file you wish to sync. You will need Admin access for this QuickBooks file. If you are not the person who will be installing the sync engine, please see the section Additional Computers with QuickBooks further below in this article to email the instructions to someone else. NOTE: You must choose the correct company file. If you sync the wrong QuickBooks file, it cannot be undone. Click Download to download the sync engine. Click the downloaded file (MethodSyncInstaller.exe) to launch the installer. Follow the onscreen instructions to install the Method Sync Engine. Eventually you will need to confirm the details of your authentication which brings us to the next step. Once the install is complete, the above application certificate will pop up. 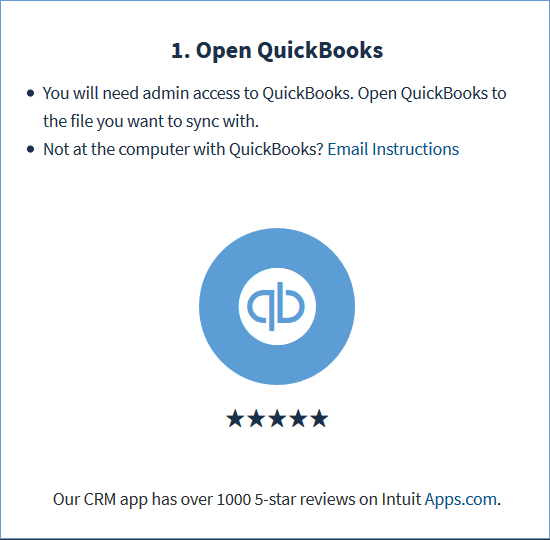 Make sure you choose "Yes, always; allow access even if QuickBooks is not running." Click Continue and then Done to start your Method sync! If you accidentally click something else, you can change these settings later from within QuickBooks under the "Integrated Apps Settings" section. And now your sync is underway! To see the status of your sync, find the Method Logo in your task bar, right-click it, and select Display. Your first sync may take a while depending on the size of your QuickBooks file. When it's complete the Method PUSH status will read connected and turn green. When you return to your browser, you will be taken into Method! 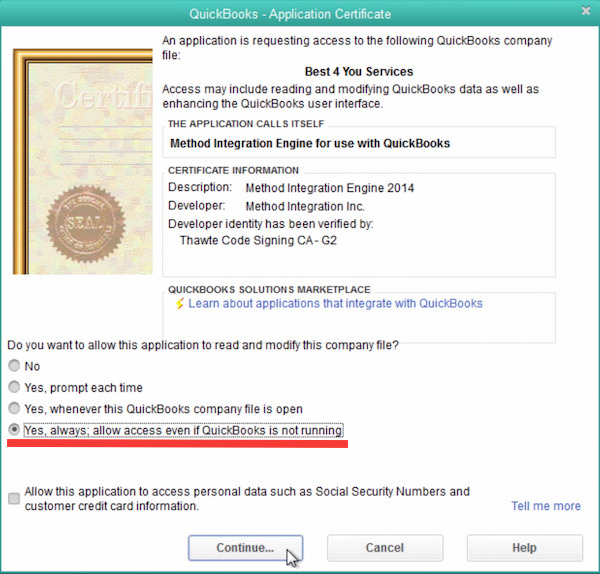 You may see a second QuickBooks Application Certificate pop up, similar to the one above. This one is to authorize the Method Integration Engine Listener. Please allow the same access as you did previously for this certificate. To ensure a real-time sync between Method and QuickBooks, the Method sync engine should be installed on each additional computer accessing the QuickBooks desktop file. Please see our article Syncing Additonal Computers with QuickBooks.